You have one of these. Everyone does. It may lack the palm tree, but surely the rest is (too) familiar--the oil-stained parking lot, the scraggly runt shrubs and grungy yellow curb, the seamed wall with scruffy paint. 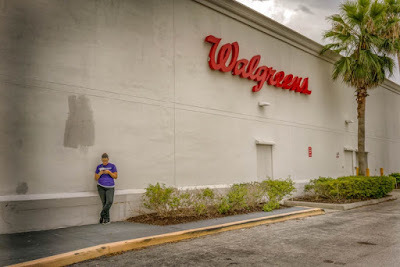 I saw this Walgreens worker hitting a cigarette and texting against this most common of suburban backdrops and ducked back into my car to get a camera. I always have cameras, I just don't take pictures with them. But I did, and the act thrilled me. The picture is what it is, common, mundane, but that was the underwhelming charm of it for me. The image will be forgotten as soon as you look away. It is not memorable. But it is not an image to remember, I tell myself. It is one to look at and to register what you feel. We have made this. It is our "home." Last night was as terrible a night as I've had. My mother has spooked me with her recent talk, and last night I awoke in horror with a splitting headache and a sickly stomach. Thinking it must be near dawn, I got up to find it was one o'clock, and knowing I would not get back to sleep, I took an Advil P.M. An hour later, feeling no effects, I got up and took another. My thoughts were a black hole of doom and gloom from which nothing could escape. I woke well after my usual hour, and now the day is shot. I think it was the scented laundry detergent my mother used to wash the sheets. Why would she use a scented detergent? It suffocated me. I took the cases off the pillows and thought of sleeping on the couch. If it had not been for the heroin in the Advil. . . . I fear for my mother, and then I fear for myself. We make our lives, and then we have to live with them. I have always prided myself in taking responsibility, but now I do not want it. I hear the pleasured taunts of those who feel I will reap what I have sown. But this is not what I should write about. I should be talking about Q's new hard-won fame. 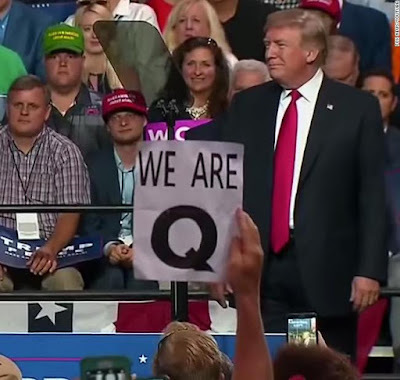 He is the leader of a conspiracy group, Trumpians through and through. I guess we all reap what we sow. The palm tree in that photograph, though, changes everything. Quite a flourish.